Enjoy all your favorite channels included with your on-campus housing. 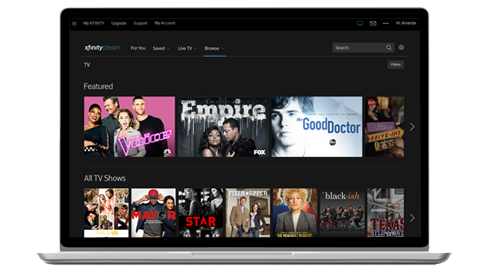 Get TV on your terms, from premium shows to nonstop live sports. All from Xfinity. Select School Use tab and shift-tab to browse suggestions after input. Confirm your choice with enter key, or esc key to close suggestions box. Restrictions apply. Not available in all areas. Limited to Xfinity On Campus customers. Pricing subject to change. Standard data charges apply to app download and usage. Check with your carrier. Comcast 2018. All Rights Reserved. HBO® and related channels and service marks are the property of Home Box Office, Inc. STARZ® and related channels and service marks are the property of Starz Entertainment, LLC. Visit starz.com for airdates/times. Counterparty © 2017 MRC II Distribution Company, L.P. All Rights Reserved. Outlander © 2017 Sony Pictures Television, Inc. All Rights Reserved. Power © 2017 Starz Entertainment, LLC. All Rights Reserved. “Billions”, “The Affair” and “Ray Donovan” ©Showtime Networks Inc. All rights reserved. SHOWTIME is a registered trademark of Showtime Networks Inc., a CBS company. The Walking Dead © 2017 AMC Film Holdings LLC. All Rights Reserved. Don't miss out on your chance to stay in the know on the latest shows and movies, thousands of on demand selections and more - all included with your campus housing! Sign up now. I would like to receive future marketing communications, special promotional offers and other advertisements from Comcast via email. Become an Xfinity On Campus Alum! Moving off-campus next school year? Join our Alumni email list to receive discounted offers from Xfinity Internet and TV products. There&apos;s either a typo, or this school isn&apos;t wired for Xfinity On Campus. Please check your spelling – or feel free to put in a good word with your school administration.